Fulfill all your creative news portal requirements with our dynamic News web portal development services. News portal is an online communication medium for all Internet users. With news portals, you can view all the appealing recent information. But instead of having so many viewers and information, the news portals are lacking authentic and useful content. Developing a news portal website is quite easy for any person who has adequate programming knowledge. 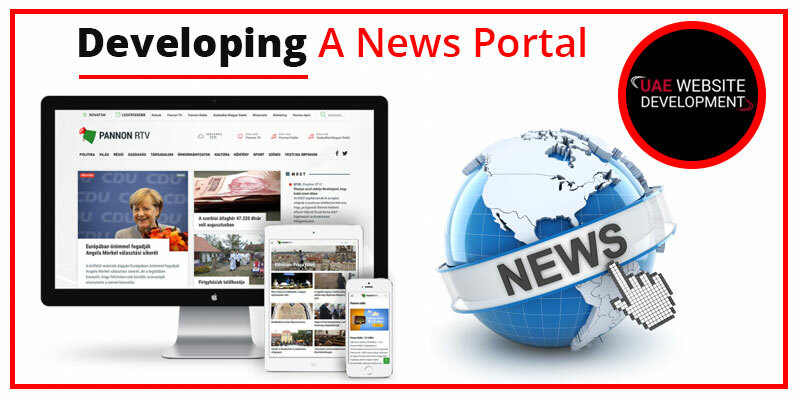 But if you are not confident enough to develop a news portal on your own, then you can connect with our service providers at UAE Website Development for News Portal Development Services. Our team consists of well-trained experts who are always available round the clock to assist you with any kind of website development service as per your requirement. Our news portals are developed with an innovative concept for higher ranking. Our websites are always user-friendly and allow an easy navigation for all users. Some of the features of our news portals are mentioned below. Users can quickly filter news by any city, state or country. There are different categories of news that will always suit the viewer’s preferences. Viewers can easily categorize the news according to their choice and preferences. The URL of our news portal websites are always SEO friendly. On our URL, there are many search options for audio, video, blogs as well as polls. The portal designs are always customized along with integrated content management. So, are you looking for a reliable service provider for News Portal Website Development in Dubai? You can choose our well-trained developers to enhance your business with a complete news portal. Our services are always consistent, and we always keep a track record of all the positive as well as the negative feedbacks from our customers. If you are looking for the best news portal development, then you are in the perfect place. We offer our clients the best portal websites by using different modern technologies. Our team is well versed in creating simple to complex news portals to meet all requirements of our clients. Our experts apply the best website development methodologies and work on various platforms to make the website come on top of the search results. The tech team at UAE Website Development provides all kinds of local as well as international news. Our portals also contain news on sports, entertainment, technology as well as politics. Our news portals are always innovative as well as technologically developed. Our services are affordable, hence will always suit your budget. The news portals are designed in such a way that it can be easily accessed by anyone. Our news includes all kinds of information essential for a perfectly functional news portal. The experts at UAE Website Development are available round the clock to provide you with a variety of web development services. Our professionals are always dedicated to delivering the best SEO friendly websites along with some great functionality. If you want technical expertise for news portal development, you can contact our experts at UAE Website Development. Our developers promise to make the work easier and to give you the result that you were searching for. You can directly call us on our helpline number 042053349. Our service providers are available round the clock to assist you with brilliant news portal development strategies. You can also directly chat with our experts on our live chat portals. We also have an official email ID where you can directly send us your service request. Our experts will connect with you soon to enhance your experience with amazing news portals.